Muscle downgrade is a major blow to your body. It’s not just muscle size and strength that are affected, it can eventually lead to a total metabolic decline. It’s important to learn what mechanisms enable your muscle to resist aging and you need to know how to trigger them. The roles your muscles play in keeping you healthy and young go far beyond locomotion. You muscular system essentially protects you against metabolic and hormonal decline, obesity, diabetes, and cardiovascular disease. It works to enhance your brain functions and keeps your body young. When you lose muscle mass, you lose energy, have a tendency to gain excess weight, are vulnerable to disease and accelerated aging. 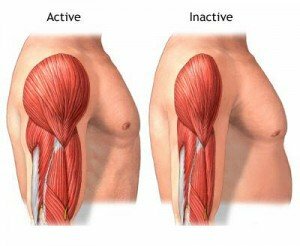 There are many causes of muscle downgrade, but it comes as no surprise that the main cause is not challenging your body to enough muscle building and maintenance activity. Some other less common but valid causes are hormonal disorders such as insulin resistance, inflammatory disease, dietary abuse, nutritional deficiencies and chemical toxicity. Another very common and widely abused cause of muscle cell damage is aerobic over-training when people choose to do hours of low intensity, single mode endurance activity such as running, cycling and so on. Pair this kind of training with inadequate nutrition and the results are even worse. This damaging duo of bad nutrition and bad training is extremely destructive and may lead over time to irreversible damage in the muscle cells along with a total metabolic decline. It’s your daily activities…how you eat, exercise and even how you rest that translate into gene activities that turn on mechanisms that dictate whether you age or stay young. Bottom line is this: muscle downgrading is a major contributing factor behind the current epidemic of obesity, diabetes and related diseases and its becoming very obvious that the benefits you get from a healthy, strong muscular system are not only essential to your health, making you feel young and strong, but they might just save your life.